Operator can also use a vacuum wand to draw powders from drums. 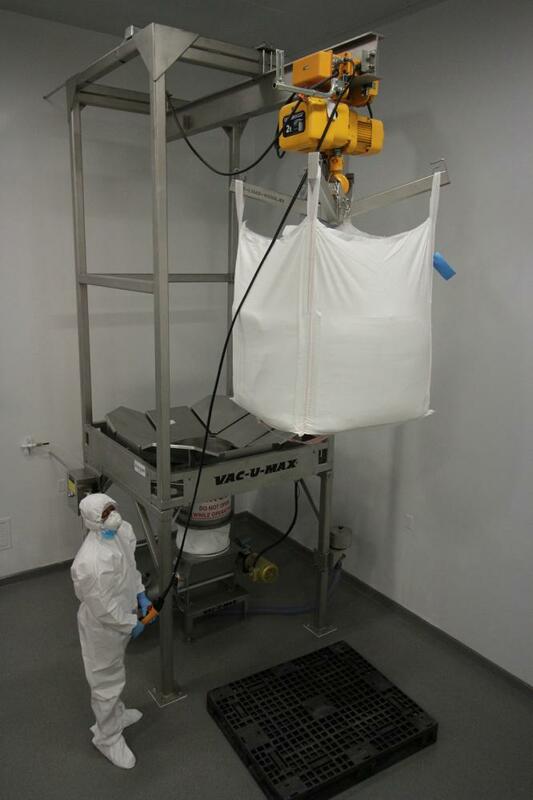 Operator(s) in safe location raise bulk bag into position in ISO class 8 clean room. Operator uses vacuum lifting device to repeatedly load bags into sanitary XP bag dump station. With global focus on health, the aging population, and overall worldwide population increases, the pharmaceutical industry focuses not only on results but also on production utilizing the most advanced process technologies. Over the past century the industry has realized unprecedented advances in human health yet is struggling to keep up with demands. Increased demand results in the need for increased production which poses a complete set of new challenges for companies in the supply chain. Such production challenges were realized by A&C. A&C is a service-driven organization finding unique solutions to its customer’s GMP challenges. It is a custom manufacturer and supplier of excipients, process solutions, buffers, and APIs. It is audited by both FDA and Health Canada, affirming its constant and stringent efforts to meet regulatory requirements for pharmaceutical and biopharmaceutical raw material suppliers. Among A&C’s service offerings, the powders processed are supplied in custom packaging meeting customer specific requirements. Product must be conveyed from different containers to the discharge point at a rate of 2200 lb/hr. Manual handling of product poses its own set of challenges including slip and fall hazards, fugitive combustible dusts, and other sanitary issues that may result in decreased production and lengthy downtime. Employing vacuum conveying technology for dust containment, labor savings, cleanliness, or safety and environmental reasons lies in the ability of vacuum conveying experts to understand powder characteristics and how those characteristics interact with equipment design. A&C also wanted the best ergonomics for their employees, so they also selected a Vac-U-Max LoadLifter for the repetitive action of lifting bags from a pallet and depositing it on the bag-opening grate of the bag dump station. As most pharmaceutical and nutraceutical processes start with a powder or granular material, material characteristics must first be defined with focus on the materials attrition and segregation, vacuum conveying behavior, flow properties, and particle properties like shape, size, cohesiveness, and bulk density. The bulk density of a material is one of the first indicators of design in terms of sizing various system components such as vacuum receivers and air sources. Bulk density helps determine how many cu ft/min of air is needed to move the material through the convey line. In A&C’s case, the bulk densities were on the heavy side at 95 and 133 lb/cu ft. Attention is given to the prospect of segregation, especially during manual transfer of materials in drums or other containers, to the next process vessel in the production process. Vibration caused by moving containers promotes segregation. While each application requires a unique resolution based on distinctive environments and equipment, systems are generally built using standard components and customized according to the application requirements. A&C’s process requires the convey and discharge of multiple materials, from diverse types of packaging (bags, bulk bags, and drums), in a clean room environment which is subject to washdown sanitation. Equally important is the introduction of material to the process (i.e., the pickup point). Product can be introduced via simple suction wand (from a drum) or a sanitary bag dump station with integral dust hood or via bulk bag (a.k.a. super sac) unloading systems. A&C introduces product to the process via Vac-U-Max’s sanitary bag dump station and the Activator bulk bag unloading system with “chisel bottom” screw dischargers. The bulk bag unload system features a dust-tight cover and cantilevered open flight 6-in. auger to provide a consistent, controlled flow of powder into the convey line. The Activator version bulk bag unloader features four pneumatically operated actuator petals to massage the lower portion of the bag in an alternating-side pattern to promote optimal material flow toward the center of the bag. “We have tested two-sided actuators, but the four-petal design is far more effective in promoting material flow to the bag outlet,” said Doan Pendleton, vice president of Vac-U-Max. The Activator assembly includes a NEMA 4X control panel and level control so that the bag is only massaged when powder is needed. The bag access door is capped for dust collection during bulk bag discharge. The Activator uses lubrication-free pneumatic lifters that consume 50% less compressed air than air-cylinders, providing A&C with lower operating costs. A&C can minimize material handling devices such as forklifts in the work area by leaving the bulk bag on a pallet, lifting and placing it into the bulk bag unloader with its integral I-Beam and 2HP hoist. The operator controls the hoist from a remote pendant, taking them safely away from the lifting zone. The "I" beam and bag lift frame are constructed in 304L stainless steel and handle bags up to 48 in. high with weights up to 2250 lb, with typical I-beam and hoist rated for up to 4000 lb. The unloader is equipped with a manual iris valve in the bag access housing that allows the operator to untie a full bulk bag discharge spout without any release of product. All product contact surfaces are designed in 316 stainless steel including the sealing collar, operator housing with access door, conical pickup adapter, and screw discharge devices. 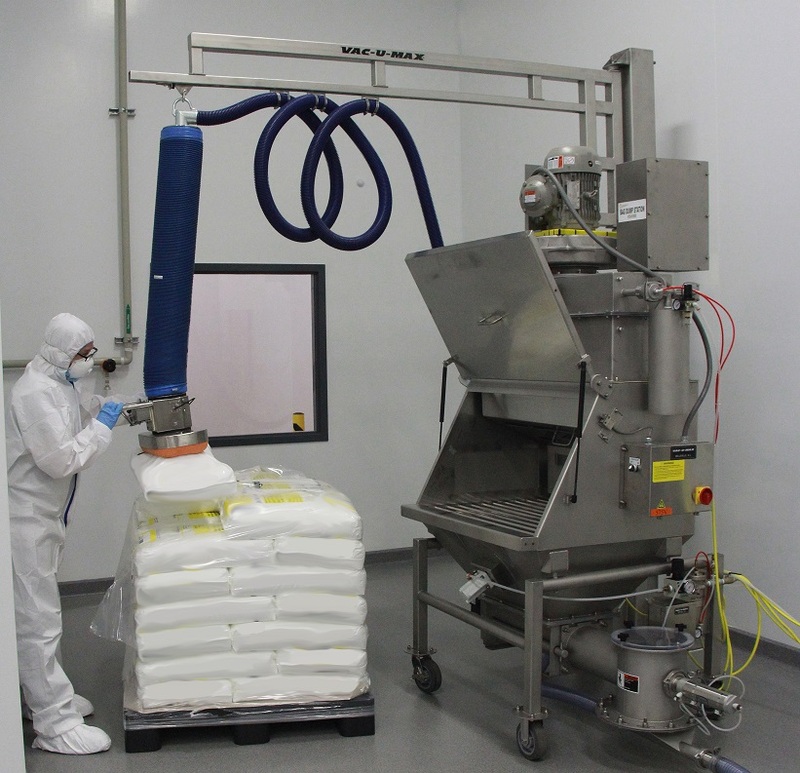 The entire bulk bag unloader is constructed in stainless steel to meet A&C’s cGMP program. The sanitary 316 stainless steel Vac-U-Max bag dump station is equipped with an integral dust collector that automatically turns on when the dump station door is opened to keep dust from the bag opening away from the operator. Dust that is collected on the static-conductive filters is pulsed automatically into the bottom of the dump station, so no material is lost. The materials have high bulk densities so the bag dump station has the same screw discharger on the bottom to provide a metered feed of material into the convey line. Like the Activator bulk bag unloader, the screw discharger has a pneumatic poppet valve on its outlet to prevent any dribbling of powder into the convey line which might affect the accuracy of the conveying process. While one of the most important factors in sizing a system, bulk density is not the sole criterion used to determine components. Another key factor in sizing and determining the type of system needed is the distance that the material is traveling. In pneumatic conveying, the more tubing incorporated into the bulk material handling system, or the further the conveying distance, results in larger vacuum pumps since it takes more airflow to pull (or push) the air through the tube. Vacuum conveying systems move product vertically and calculated the same as moving product horizontally--in linear ft. However, each 90-degree sweep in the system equals 20 linear feet; thus, moving material horizontally 110 feet (34m) and vertically 110 ft with four 90-degree sweeps results in an overall conveying distance of 300 ft. Vacuum conveying technology was selected by A&C because any leaks in the system will be inward and mitigates the risk of appositive-pressure system that develops a leak results in a cloud, or pile, or powder in the work environment. This not only reduces exposure for the operators, but also aids in reducing combustible dust, sanitation, and product yield issues. In addition to factoring how many vertical rises and horizontal runs, the bulk material handling system factors in the number of equipment connections, headroom requirements for vacuum receiver mounts, and any containment or clean room requirements, as required by A&C. By reducing the number of overall process steps, processors reduce the potential for product segregation resulting in better quality control, smaller equipment, simplified 1:1 scale-up, and shorter production time – while reducing labor and maintenance costs. 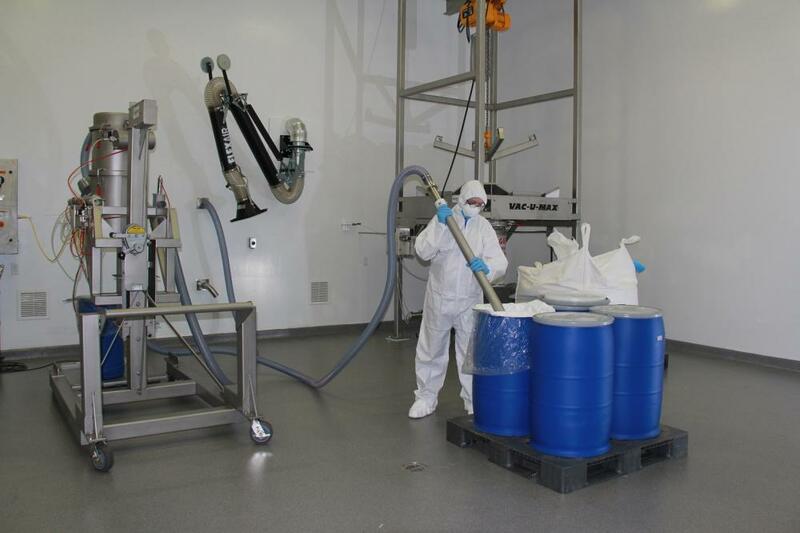 Self-sufficient and the heart of the process, the sanitary pharma-grade Vac-U-Max vacuum conveyor is mounted on a rolling lift frame to allow A&C to remove the equipment from the production room for cleaning. The lifting frame allows the conveyor to be raised into operating position above the drum on a scale, and to lower it to a travel position which is also a convenient height that encourages good maintenance and sanitation of the equipment. The vacuum conveyor is integrated into a screw discharger to eliminate conical hoppers and discharge valves. All product contact parts are designed in 316L stainless steel per 3A Sanitary and USDA design standards. A pneumatic poppet valve on the end of the screw discharger prevents any chance of dribble feed from the receiver into the conveying line. A gas pulse is sent to the receiver’s filter to release any entrained material that may have accumulated on the filter during conveying. A good vacuum conveyor needs a good vacuum producer. The vacuum producer selected for A&C’s system is a continuous-duty 5HP regen blower unit due to its vacuum production and airflow, compact size, direct-driven impeller, and low noise level--ideal for a pharmaceutical environment. If the vacuum conveyor is the heart of the system, the controls must be the brains of the operation. Vac-U-Max was able to provide A&C with a C-UL-labelled main control panel in compliance with Canadian electrical standards. “This is a great benefit for my customers in Quebec,” said John Hamilton of Hamilton Process Systems Inc., the Vac-U-Max representative for the province for over 16 years. Vac-U-Max is a UL- and C-UL certified control panel builder for general purpose and explosion-hazard environments. The control panel at A&C incorporates all electrical and pneumatic functions from the bulk bag unloader, bag dump station, vacuum conveyor, three screw dischargers, and a platform scale. The remote devices are plugged into the main control panel with quick disconnect plugs that can be disconnected and capped before washdown. The vacuum transfer principle is used as a continuous refill device for continuous operation. Pneumatic receivers use negative pressure to draw material required for refill into the vacuum receiver which is filled to a pre-determined level, with receiver holding a charge of material until the process below requests a refill. The level of material in the vacuum receiver is determined by level sensors. When the process requires a refill, the discharge valve opens, discharging material to the process below – keeping material moving from source to process. Vacuum receivers are designed crevice free and are easily cleaned. Systems are very simple to operate, with easy-to-use pick up devices. There are minimal moving parts in contact with product. Now, more than ever, pharmaceutical and nutraceutical manufacturers are enhancing production capabilities by implementing vacuum technology to deliver drugs to consumers faster, safer, and more economically. When determining the optimal refill method for your processing or packaging equipment, look at refill device response time which should be quick and fast. It is also important to review the overall space and height limitations. Eliminate segregation concerns and evaluate overall cleanability of the refill device. Vacuum technology provides safer transfer of bulk dry materials, delivering solutions to tight industry standards for sanitation and environmental safety. When pharmaceutical supply chain companies work with expert vacuum conveying manufacturers to design equipment that will perform well with existing equipment and specific processes, they are accessing not only industry specific know-how, but expertise in powder characteristics that transfer from industry to industry assuring processors, through written guarantees, that the equipment will perform the way it is supposed to. For more information about how Vac-U-Max vacuum conveying systems and industrial hygiene solutions improve processes, e-mail [email protected], call 973-759-4600, or visit www.vac-u-max.com. 1. ISPE. ispe.org/initiatives/regulatory-resources/gmp GMP Resources. International Society of Pharmaceutical Engineering.